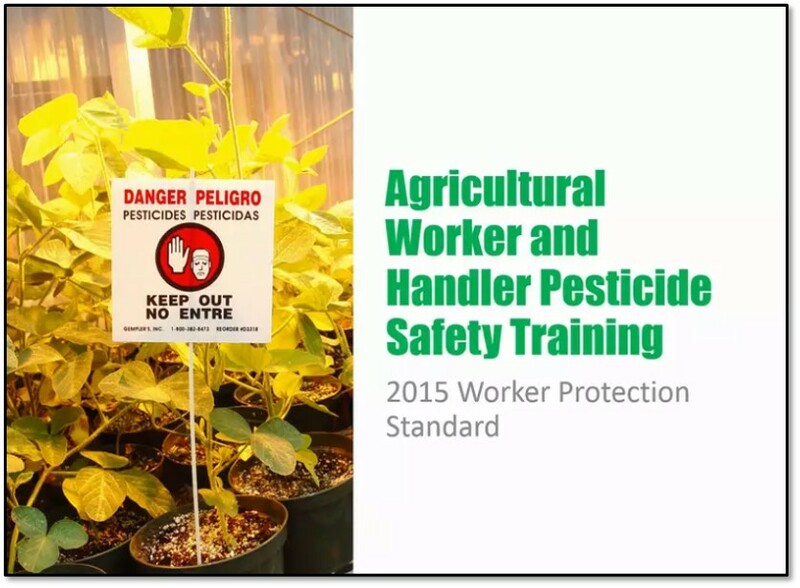 Video (English) – Agricultural Worker and Handler Pesticide Safety Training (MP4). Iowa State University. May 11, 2017. It is approved by EPA for training of both handlers and workers under the revised Worker Protection Standard (WPS). It is compliant with the new content requirements for 2018 and can be used prior to that in 2017 (and beyond). EPA Approval # “EPA W/H PST 00022”. Length: 38 minutes. As an alternative to this video, a PowerPoint and script are also available at www.extension.iastate.edu/psep/workerprotect.html (go to 2017 and/or 2018 Training Tab – Training Resources). The video, PowerPoint and script can be used in 2017, 2018, and beyond. These resources are in compliance with WPS requirements that go into effect January 2, 2018, including expanded training on instructions to reduce take-home exposure from pesticides on work clothing and other safety topics. The Pesticide Safety Education Program (PSEP) at Iowa State University and the Iowa Department of Agriculture and Land Stewardship (IDALS), Pesticide Bureau produced this new EPA-approved PowerPoint and narrated video to train workers and handlers under the 2015 revised WPS. This project was funded by IDALS through a grant from the U.S. EPA. Feel free to contact your local county Rutgers New Jersey Agricultural Experiment Station (NJAES) Cooperative Extension, or Rutgers Pesticide Safety Education Program (848-932-9802) for further assistance.